I am partnering with Hire Influence, Southwest Airlines and Mondelez/Ritz Crackers for a food and travel inspired blog post series. This is a sponsored post, however opinions are my own. 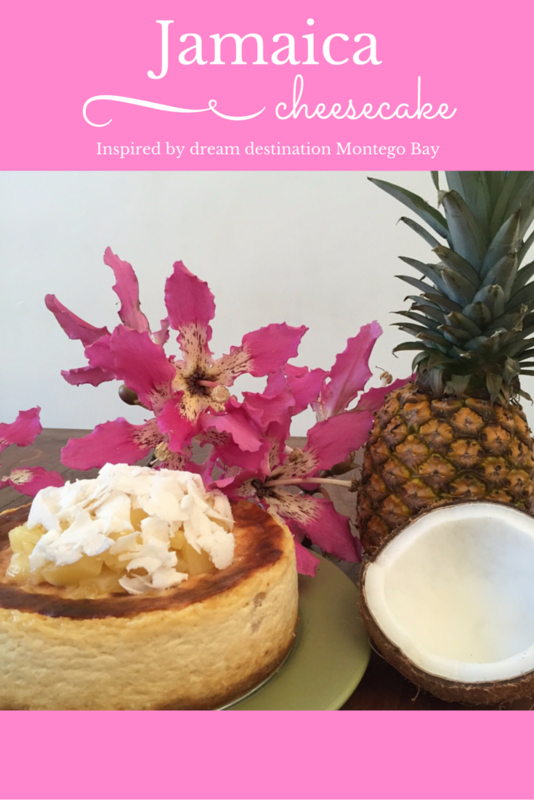 VOTE for this Jamaica Coconut Pineapple Cheesecake Recipe and while you're there enter to WIN $5000 in Southwest Airlines giftcards. Our family of six loves to travel and we've done dozens of U.S. road trips as well as traveled by air to exotic corners of the world many thousands of miles away from our home in L.A. When it comes to vacation travel, we often choose Southwest Airlines which has routes from our departure city of Los Angeles International Airport to many American cites as well as six other countries. Next up on my travel bucket list I'm dreaming of a trip to Montego Bay, Jamaica -- luckily it's a Southwest destination. Inspired by that vacation idea I came up with a wonderfully exotic and delicious Jamaican Coconut Pineapple Cheesecake that substitutes Ritz Crackers for graham crackers in the crust. You're in encouraged to read on and learn how to make this new take on the classic cheesecake to will make you wish you were on a tropical island. Don't miss my other new blogpost showcasing another delicious, Southwest destination-inspired recipe made with Ritz Crackers: California Mini Tostadas. 1. Grind the Ritz Crackers and macadamian nuts in a blender or food processor. 2. Place ground cracker/nut mixture in bowl and add brown sugar, shredded coconut and vanilla and mix well. 3. Firmly press crust into bottom of an 8" spring form baking pan. Set aside. 4. In a large bowl using an electric handheld or stand mixer, mix cream cheese, cottage cheese, ricotta cheese, and eggs, then add sugar, salt, flour, sour cream, and milk. Beat until well blended. 5. Pour the cheesecake batter into prepared crust. 6. Drop chopped pineapple bits into the batter, sprinkling over the top of batter so that some pineapple remains near the surface and other bits descend down into the batter at various levels. 7. Bake in oven at 350 degrees for 60-70 minutes until baked through and lightly browned on top. Toward the end of baking time, watch through the glass door carefully for desired doneness without opening the door. 8. After baking time as ended, turn oven off. Leave cake in the oven for an additional hour to gradually cool to avoid the surface cracking. 9. Remove from pan and chill for a a few hours or overnight. Transfer to cake platter and garnish with fresh pineapple and coconut. For an extra Jamaican tropical touch you can also add exotic flowers to decorate and/or drizzle 1 T. of your favorite rum on top of the cheese cake. 10. Cut cheesecake with a sharp knife dipped into hot water for easy slicing, adding some of the pineapple and coconut garnish to each serving. Take in the view of your guests enjoying every bite and don't be surprised if they ask for seconds. Dallas-based Southwest Airlines is in its 44th year of service with 47,000 employees serving 100 million customers each year. The airline operates 3,600 flights per day, serving 94 destinations across the U.S. including my hometown of L.A. and six additional countries. For more information visit the official website as well as follow Southwest on Twitter, Facebook and Instagram. Ritz Crackers are a classic snack which has been enjoyed for generations. They're widely available and easy to find in markets across America. Flavors to choose from include Original, Whole Wheat, Bacon, Garlic Butter and other varieties. 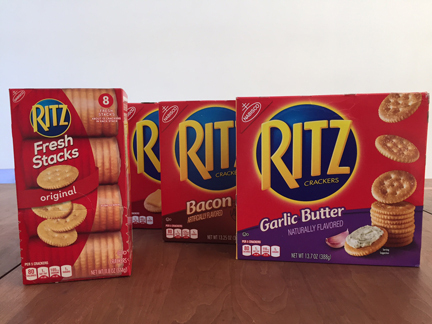 Learn about Ritz Crackers on the official website where you'll also find lots more delicious recipes. You can also stay up on everything the brand is doing and get more ideas of how to enjoy Ritz Crackers by following them on Facebook, Twitter, Pinterest and Google+. 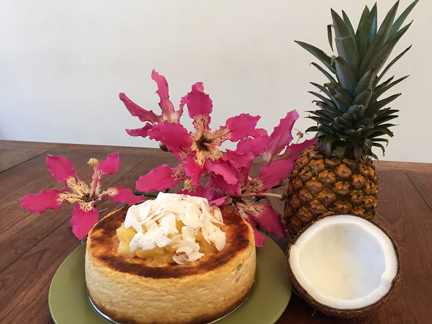 Remember to VOTE for this Jamaica Coconut Pineapple Cheesecake Recipe and while you're there enter to WIN $5000 in Southwest Airlines giftcards. FTC Disclosure: In concert with Hire Influence, I am being compensated for this Southwest Airlines and Mondelez/Ritz Crackers blog series campaign. However opinions here are my own. See complete FTC Disclosure information that appears at the bottom of MommyBlogExpert's home page and at the bottom of every individual post on this blog, including this one. I'm missing Jamaica! We went last month on Southwest!!!! Love the flavors in this cheesecake and it's so beautiful. YES PLEASE. Wow, that sounds super yummy! I can't wait to try this. Now this is a combo I never would have thought to put together. Sounds very tropical indeed! This looks so delicious. I am definitely going to make this. I never would have thought to use coconut with a cheesecake, but I am completely loving that idea! It sounds delicious. A trip to Jamaica would be amazing, wouldn't it? Since I can't make it there any time soon, I will have to try this Jamaican-inspired cheesecake! It looks so good. I am fascinated by this flavour combination and need to give this a try. I love making cheesecake and never thought about using crackers for the crust. Wow, that turned out great! I love themed meals, so this will be the perfect end to a little Carribean flair! I love cheescake. I have never tried Jamaican cheesecake though. It is like a pina colada cheesecake. I never would have thought of it but it sounds yummy! Ritz crackers for a cheesecake crust! that is very different but i can only imagine that it yummy with the salt and sweet. what a great combo. We haven't been to Jamaica since our honeymoon! My husband loves cheesecake. I think I'll make this for him perhaps that will prompt him to want to go back too! I absolutely love cheesecake and this one looks super tasty! Can't wait to make it! Now that looks absolutely scrumptious. It's so fluffy and tasty looking. That looks so delicious. This is the best take on cheesecake I've ever seen. I have never seen a cheesecake like this before. I can't wait to make this and then stuff my face with it! Cheesecake is one of my absolute favorites! My husband would love this! He love pineapple! Cheesecake is one of my favourite desserts. Yours looks delicious and I do love coconut and pineapple. Definitely a Jamaican feel to it. 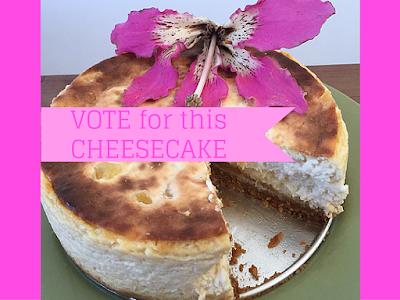 I will definitely be voting for your cheesecake. My hubby LOVES cheesecake any way he can get it! I might surprise him with this one! My husband adores cheesecake! This looks like such a tender, fluffy one! This sounds like really good cheesecake!! I never would have thought to put coconut and pineapple on them! Yum! That looks and sounds amazing! I need to make this! Good luck in the contest! That looks sooo good! My niece is all about cheesecake, so I will have to share this with her! OMG, this looks incredible. I bet it tastes even better. I hope to visit Jamaica some day. And this cheesecake looks amazing! Can't wait to try it. That sounds yummy. Coconut and pineapple is a yummy combination. I've never tried using Ritz crackers, though. I want to try it. What a delicious combination! I would love to recreate this one! Such beautiful presentation in your photos! This recipe sounds delicious! I also really enjoy flying with Southwest. I've had excellent experiences with their customer service and their prices are usually better than other airlines from my location. Good luck and I hope you win. This cheesecake sounds so rich and wonderful. There are so many great flavors in it.